Year after year frameless enclosures are becoming more and more popular. These enclosures are made with either 3/8″ or 1/2″ glass and have very limited hardware. Browse our gallery and view the most common configurations. Sliding or bypass doors are still very popular today. 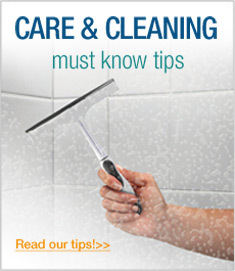 They have a multitude of applications both for walk in showers and bath tubs. Framed or frameless in your choice of finishes, these are a real space saver. Don’t forget to look at the new headerless collection from CR Laurence. You will be amazed! If a single swing door is needed, look no further. Choose from framed, semi-frameless, or frameless. All options are available for up to a 36″ opening. Choose any finish and glass option for your new door and transform your new bathroom with a touch of elegance. With a door and panel enclosure we can create walls of glass to complete any bathroom design. Both framed and semi-frameless models are available to complement your individual style and budget. 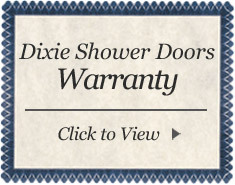 Dixie Shower Doors offers the most extensive selection of finish options to complement your faucets and fixtures. Our finishes are the broadest in the industry with 14 to choose from. In addition, CR Laurence is by far the industries leader in frameless shower door hardware. Although clear glass is by far the most popular choice, we offer a vast array of both obscure and patterned glass. For those with a different look or design in mind, explore our options.